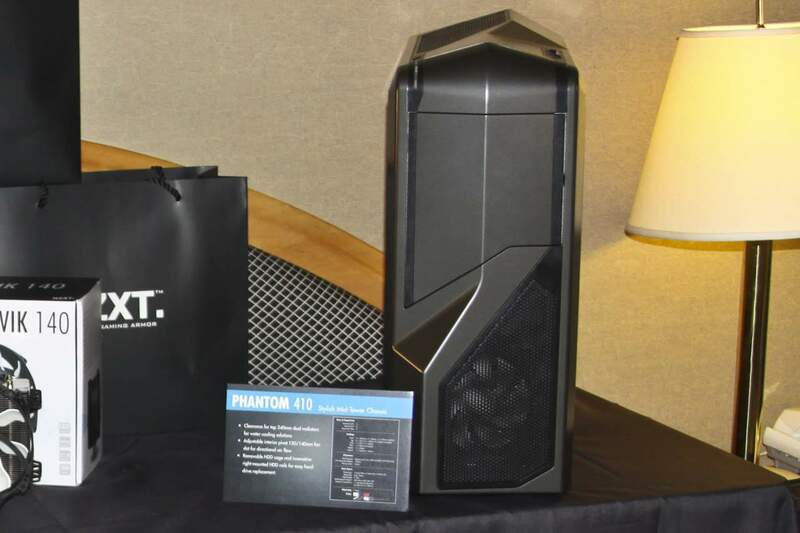 COMPUTEX 2012 - NZXT Unveils New Notebook Coolers and a New Phantom! 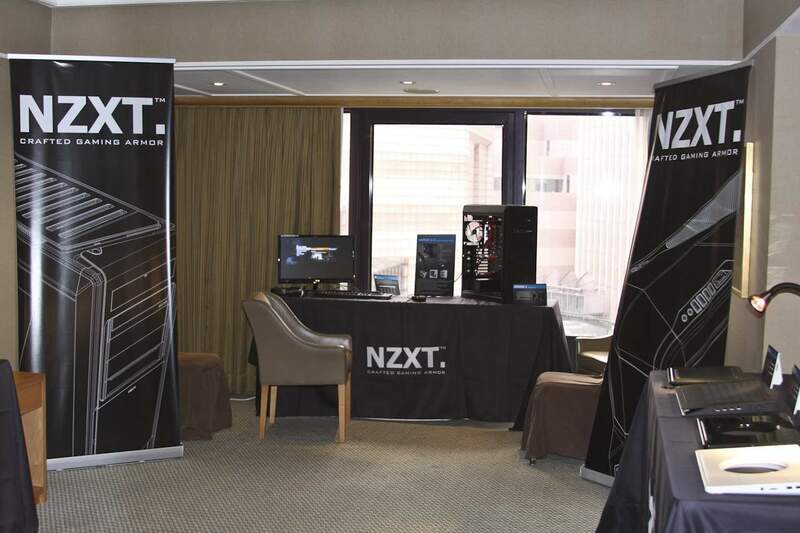 NZXT., one of Futurelooks' personal favourite companies for gaming cases was once again at COMPUTEX 2012 this year. They had some things to show off plus a few things they did not show off but we'll try to touch on those too. Notebook gamers and desktop gamers will be taken care of at NZXT. in 2012! The Cryo line up has been one of NZXT's most popular products for notebook gamers. 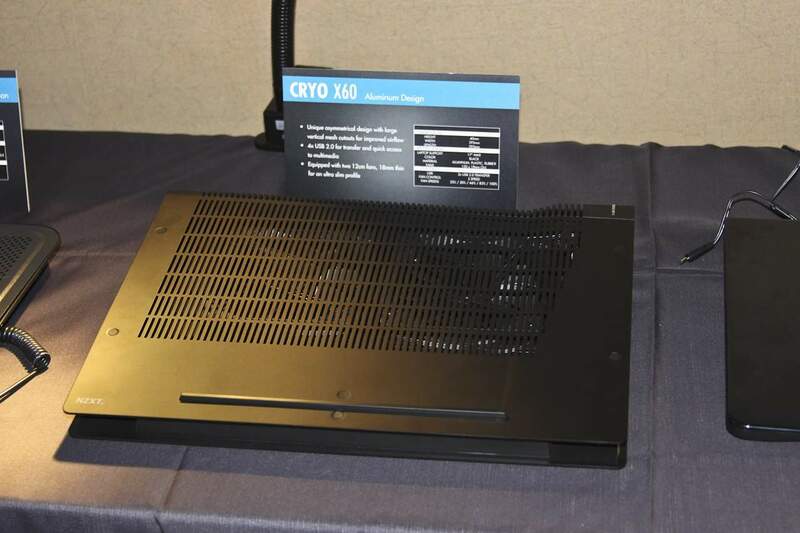 Anyone that has ever toted around a massive gaming notebook appreciated the Cryo LX, which was one of the biggest notebook coolers on the market at the time. 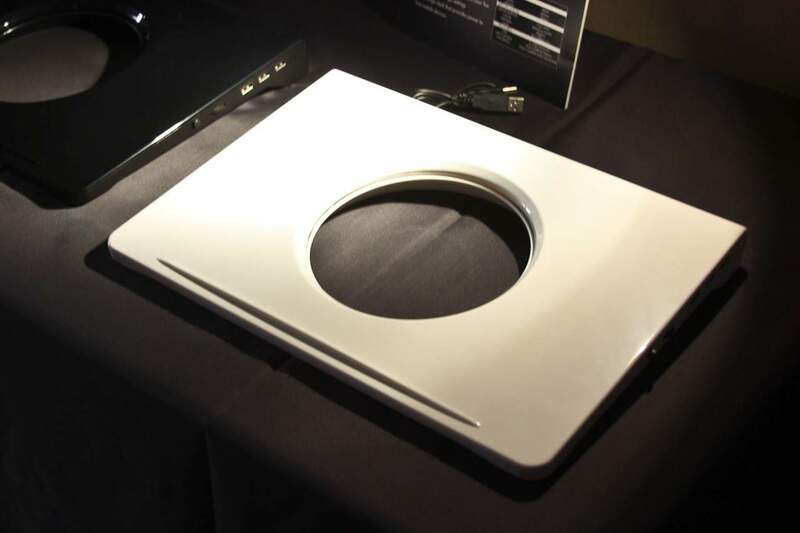 At COMPUTEX 2012, they announced a new cooler that eliminates all the individual fans and replaces it with one bigger, more efficient bladeless design. This is very similar to what Dyson does with their fans, but on a much smaller scale. The result is a constant stream of cool air that is pushed towards the bottom of your notebook. The Cryo V60 will come in white and black in a glossy finish and feature a fan control onboard as well as a USB charge dock that can charge up two more mobile devices. No word on whether that works for peripherals as well like mouse and keyboard. The other cooler at the booth was the Cryo X60 which is a more traditional design using two very thin 120mm fans to improve the profile of the unit. It uses an aluminum chassis with an assymetrical design which is more in keeping with the ventilation placement of most notebooks. It comes with a four port USB hub that can be used to both charge your mobile devices and/or be used for peripherals and storage devices. No, this is not named after the head guy of the company, Mr. Johnny Hou. 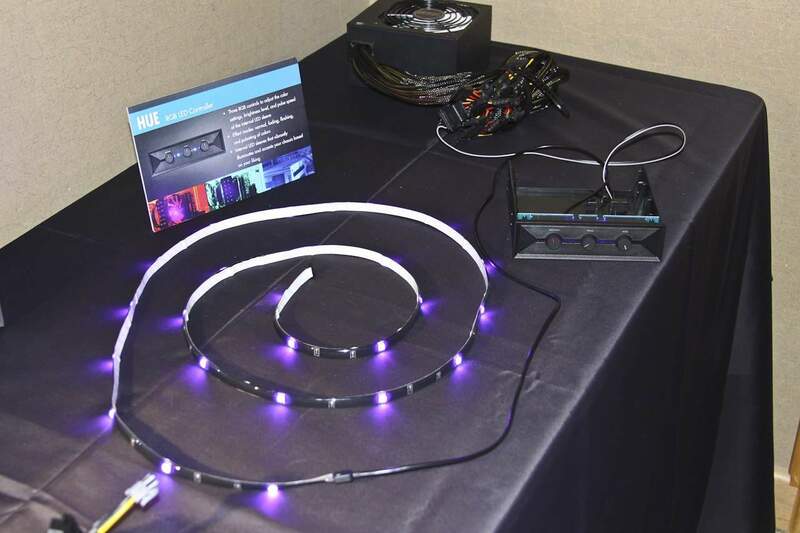 This product is built for folks that want more control of their LED lighting strips. The device has the capability to not only control the intensity of the LEDs, but can also fade, flash, and pulsate, giving your systems some bling at your next LAN party. It can even change the color of the strips depending on what your color scheme is from Red, Green or Blue (RGB). I guess that's why they call it the HUE RGB LED Controller. OK, let's start off with what CAN be shown. The Phantom 410 will be receiving a new color combination. The gunmetal grey is striking and should give those that don't like the shinier, happier colors of the 410, an opportunity to finally get into one of the best mid-tower gaming cases we've seen for around or under $99 US. We expect to see a lot of these at the next LAN event. Now let's talk about what we CAN NOT show you. For folks that are fans of the original NZXT Phantom, the next gen case will feature things that bring it up to date with the rest of the line up. You'll see it sporting a lot of the things that the current flagship Switch 810 has to offer including an SD card reader, the ability to remove the drive bays to accommodate large graphics cards, and for those of us that have ever had people nosing around your system to rip off an SSD, the new Phantom will also have mounting points on the back of the case for your 2.5 inch drives. That means you can pack an SSD system drive and maybe a 750GB Momentus XT 2.5 inch drive back there and you've got a substantial weight reduction for your next LAN party rig when compared to running 3.5 inch drives. The cable management of the case has also been refined as well and if the Switch 810 is any indication, we may see some tweaks to make it even more water cooling friendly. Consider our appetites whetted! That concludes our COMPUTEX 2012 coverage for this year. If you haven't checked out our other COMPUTEX coverage, you can find it all right here.